Owning a treadmill is a lot like owning a car – if you want it to last, then you have to do some routine maintenance on it. It makes sense that a piece of equipment that’s dedicated to working as hard as you do should need some TLC, but not everyone does it. It may seem intimidating to maintain a treadmill, but all it takes is three simple routines to keep your treadmill running smoothly for a long time. Most treadmills will require that you use a 100% silicon to lube down your belt. Lubricating your treadmill belt will help to make sure that the belt is moving smoothly whenever you’re running on it. Before you begin lubricating, make sure your treadmill is off and that you have 100% silicon. If there are any other additives, it may end up eating away at your belt. There are generally two different methods to lubricating your treadmill belt. First, you can use a treadmill lubricating stick that has a handle and then a sponge pad at the end. Lift the belt up on one end and stick the wand underneath the belt with the padded side down. Work your way down the deck and then repeat on the other side. The second method is to apply silicon directly from a spray bottle. The idea is still the same, but it may not be as efficient. You can also use a sponge to spread the silicon around underneath the walking belt. Similar to how your car tires need to be rotated, your treadmill belt will also have to be realigned after some use. The treadmill belt migrates naturally whether it’s from how your foot strikes the deck or stretching over time. All it takes to center your belt is an Allen wrench. Every treadmill has some holes towards the end of the deck that have an Allen bolt head. If you tinker with it, you will be able to manipulate the back roller that holds your belt in place. Turn the bolt little by little so that you can adjust the belt with small movements. Make sure there is space on either side of the belt when you’re done. 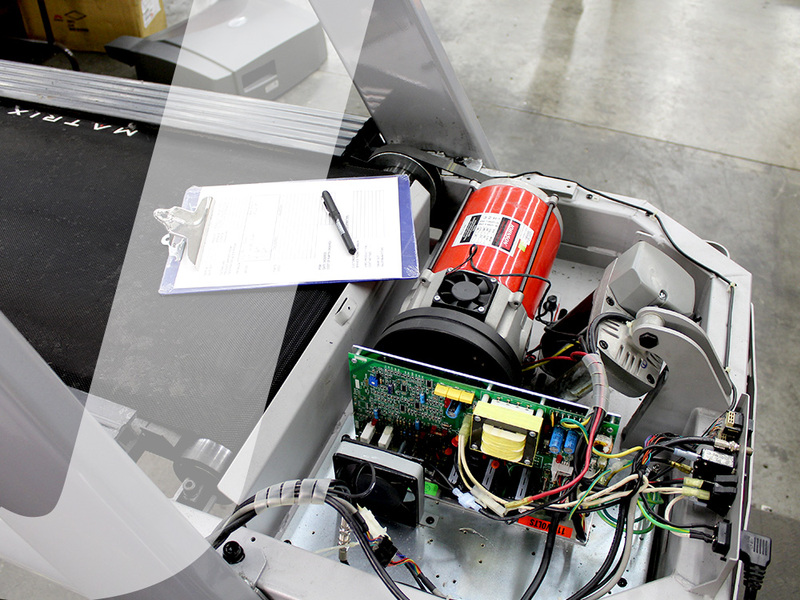 If your treadmill has an open back or an open floor, chances are your motor cover will eventually get clogged up with dust, hair and debris. Never cleaning under the motor cover is like never taking your car for an oil change – your equipment probably is not going to last very long if you don’t do it. This maintenance tip just involves taking out a few screws and vacuuming or dusting everything that was under the motor cover. Avoid using cleaning liquids so that you don’t short circuit your machine. This is something you should do every few months (or more frequently if you have a pet that sheds.) While it’s an easy tip, just try to be gentle when cleaning to avoid messing with the circuit boards and motor.